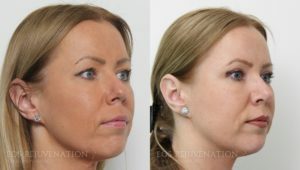 This young woman was interested in achieving more balance for her face. 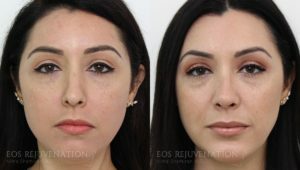 She did not like her droopy tip, nor did she like the fact that her nose was crooked on frontal view. 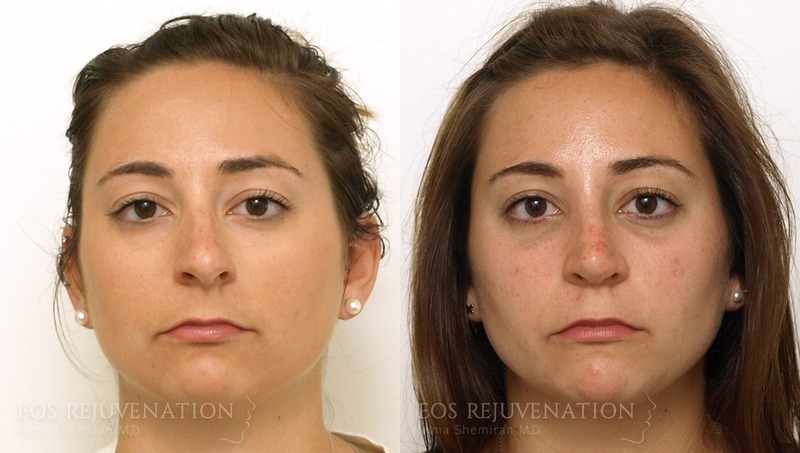 She also had trouble breathing through her nose and had a deviated septum. 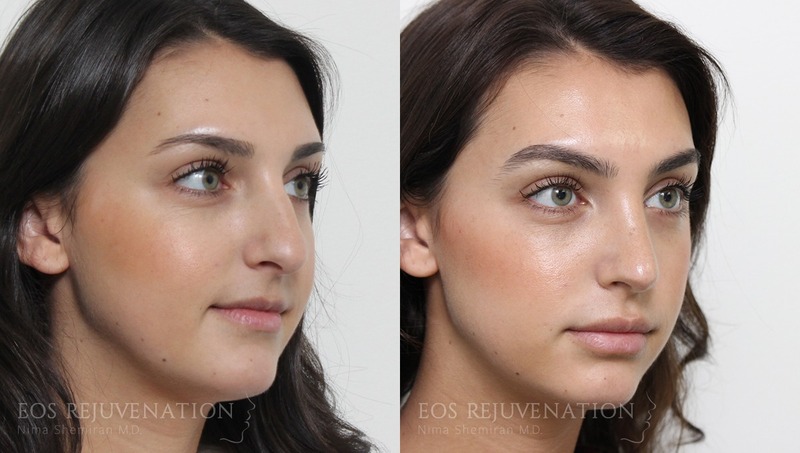 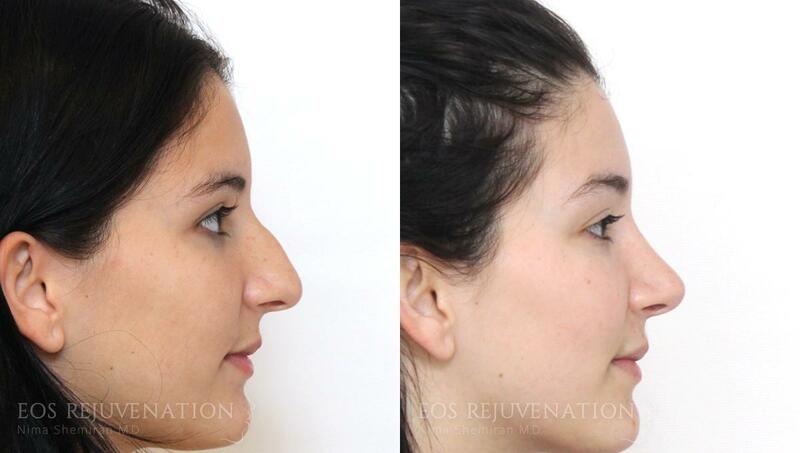 After open rhinoplasty her nose looks more proportional, the tip is lifted, and is more narrowed from frontal view. 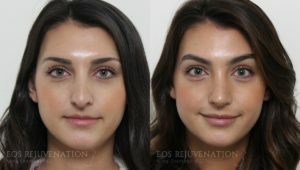 Of note, she also had some cheek augmentation and lip augmentation in her after picture. This young woman came in because she had a large bump on her nose and a droopy tip, especially when she smiled. 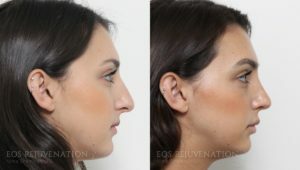 On frontal view, she did not like the fact that her tip was bulbous and her nose was wide. After surgery, her tip is nicely defined, especially on frontal view. 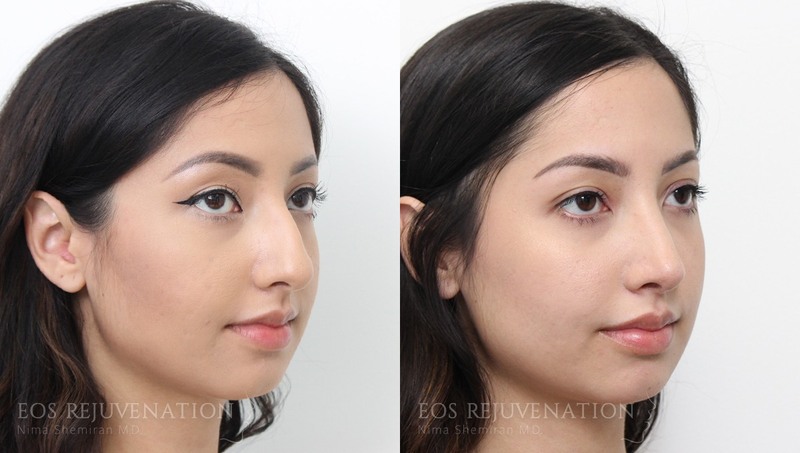 The bump was removed and she has a slight lift in her tip that looks natural. 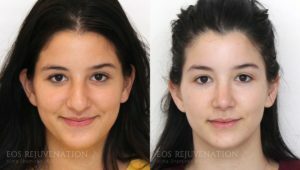 She is very happy with the results. 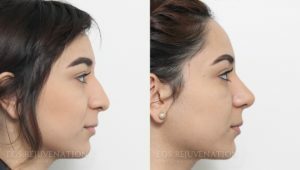 This young woman came in because not only does she have a large hump and a slightly droopy tip, but was also crooked and wide on frontal view. 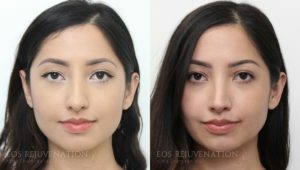 She also did not like her tip which was bulbous. 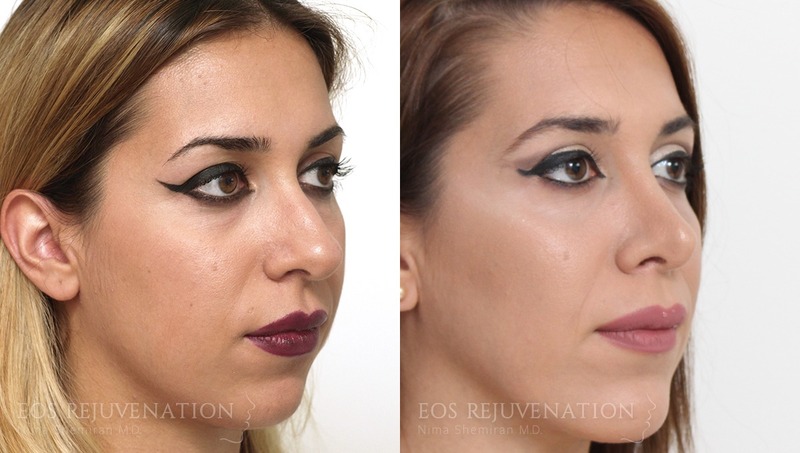 This was a more difficult rhinoplasty because of the asymmetries and crookedness. An open rhinoplasty was performed along with hump removal, osteotomies to narrow the bones, as well as tip-refining sutures and grafting. Her final results are six months after rhinoplasty showing a much more refined nose. This is another young woman who wanted a slight lift in her tip and the bump removed. On frontal view, her tip was bulbous and ill-defined. It was also crooked, where her nose leaned a little bit towards the right side. 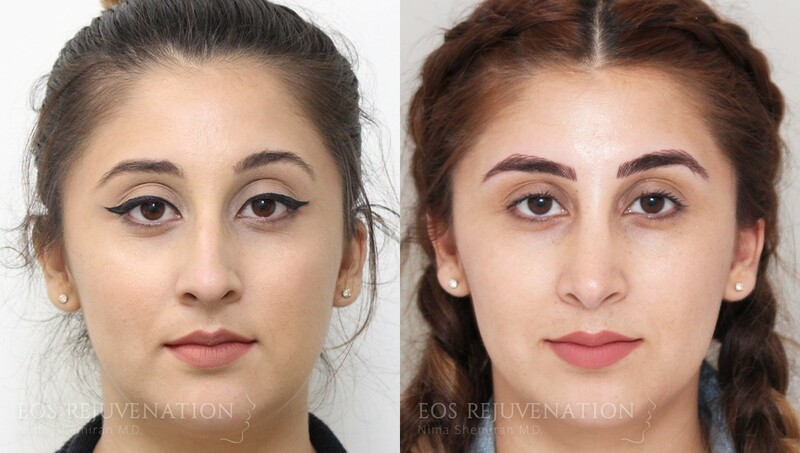 She wanted something that looked natural and where no one would be able to tell the difference. In her after pictures, you can see her hump is removed, her tip is slightly lifted, and it is also more defined. On base view, even though she had an open rhinoplasty, there is no evidence of an incision ever being placed. 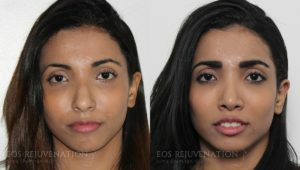 These photos are taken 1 years after her rhinoplasty. 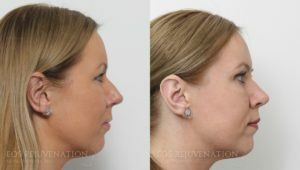 This young woman came in with a large dorsal hump, and a wide nose from the front. 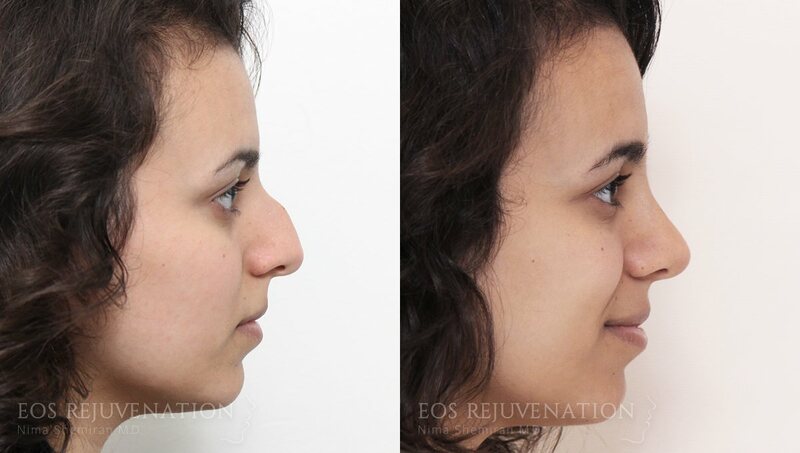 She also had an asymmetry from frontal view where the nose leaned towards the left side, causing external deviation. She wanted something that looked natural and fit her ethnicity. After open rhinoplasty, the hump was removed and the nose was narrowed in order to look more defined. These results are 6 months after her rhinoplasty. 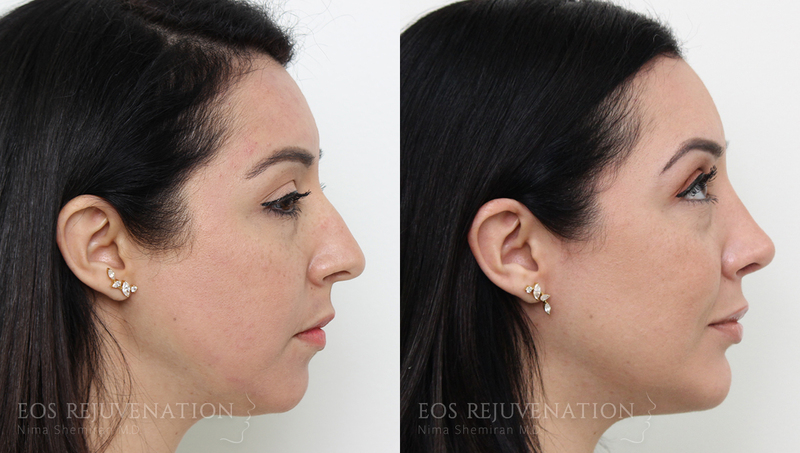 This woman, in her 40s, came in to see me because she did not like the way her nose looked from the side, where she had a small hump. She wanted a more straight profile with the bump removed.. She also had a bulbous tip and it leaned towards the right side. She wanted something that looked more natural. 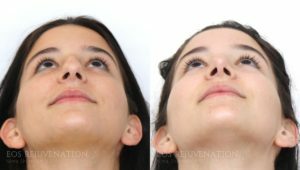 After rhinoplasty, her bridge is more defined and the hump is removed. On frontal view, the tip is more refined, narrowed, and straightened. 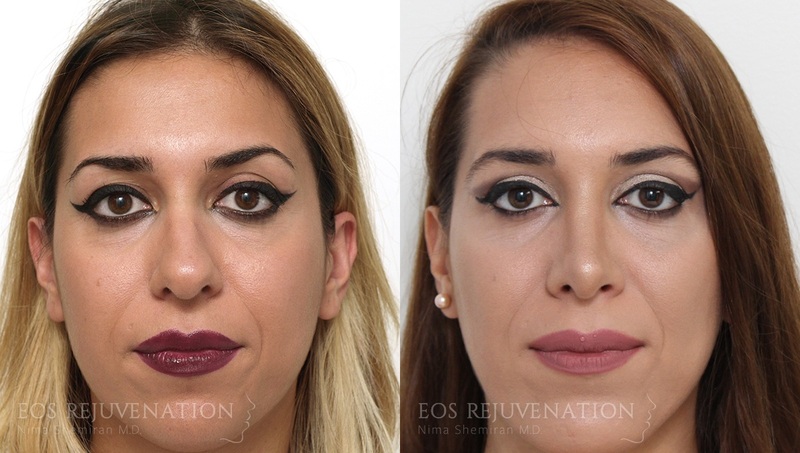 Of note, this patient also had an upper blepharoplasty to make her eyes look more open. 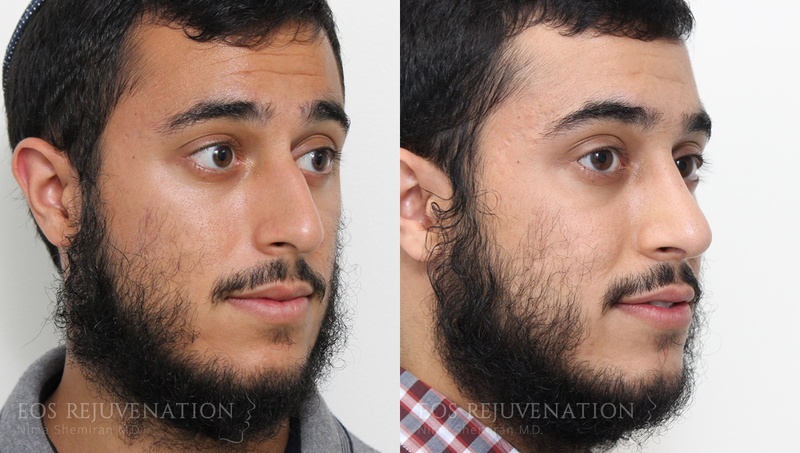 This young man came in with breathing issues through his nose and a very a droopy tip that he wanted more refined. 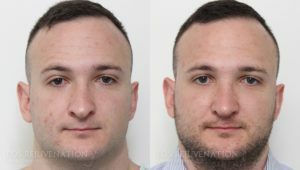 He had to sleep with his mouth open and had shortness of breath during exercise. After open rhinoplasty his tip is more supported, he has a straight profile, and on frontal view it looks more symmetric. 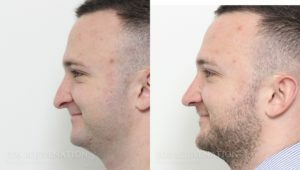 He has been very happy with the results and is able to breathe better. 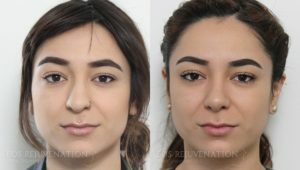 This young woman came in because she did not like the hump on her nose, her forehead blended with her nose, and she wanted a slight lift to her tip. 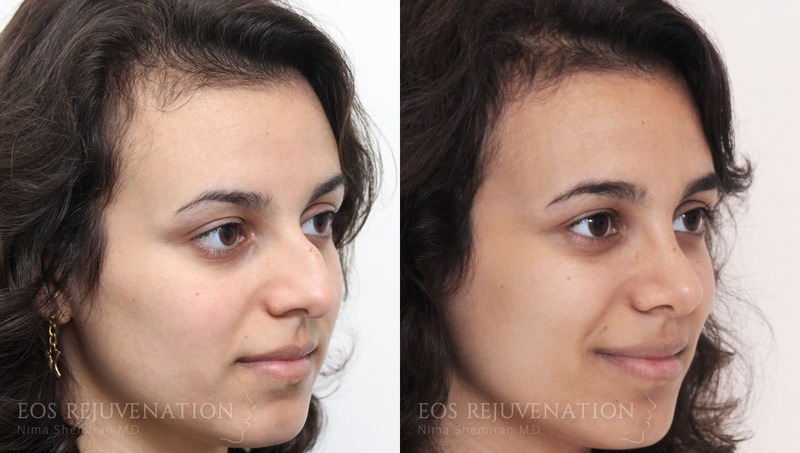 On frontal view, she just wanted a more refined nose and straighter because it leaned towards the right side. 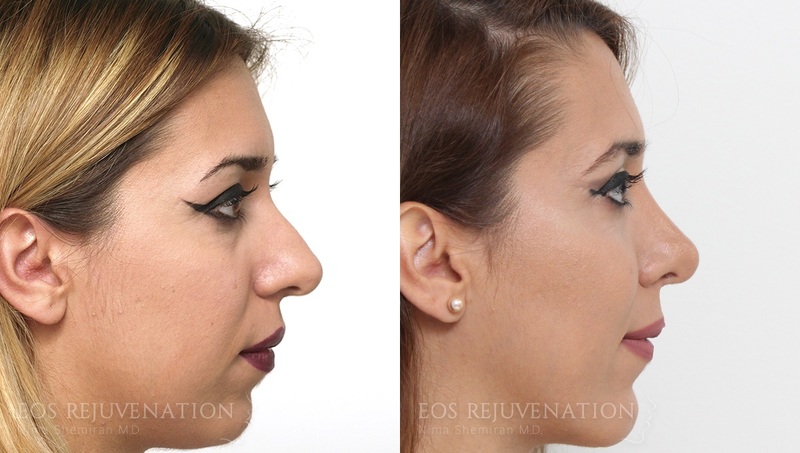 After rhinoplasty surgery, the tip has been nicely lifted. She has a slight curve to her bridge, which is very feminine. 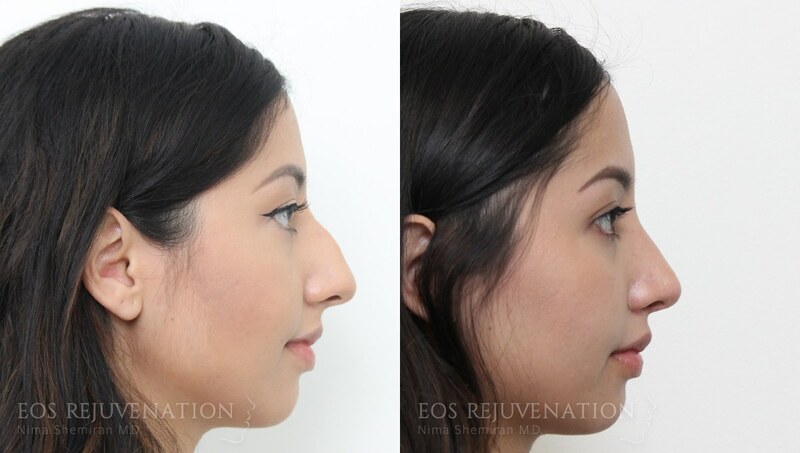 She is able to breathe better and her nose is more straight on frontal view. This young woman came in because she had thick skin, a droopy tip, and hump on her nose. 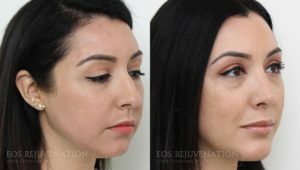 She wanted something that looked really natural. In addition, her tip was deviated towards the right side and she wanted is straightened. 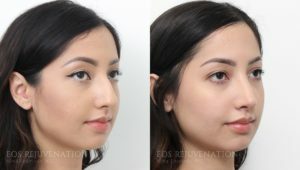 After rhinoplasty surgery, her tip is nicely lifted, the bridge has been reduced for a more straight profile, and the tip is more straight on frontal view. Results shown are 6 months after surgery. 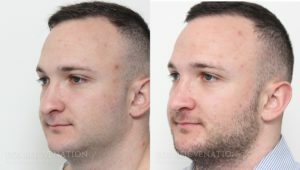 This young man came in because he had a slightly droopy tip, a hump on his nose, as well as a slight lean towards the left side on frontal view. He wanted something that looked natural with improved breathing. 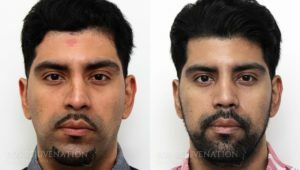 After rhinoplasty surgery, the hump has been removed and his tip slightly lifted for a masculine look. 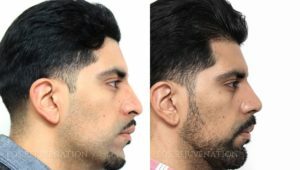 On frontal view, his nose is more straight. 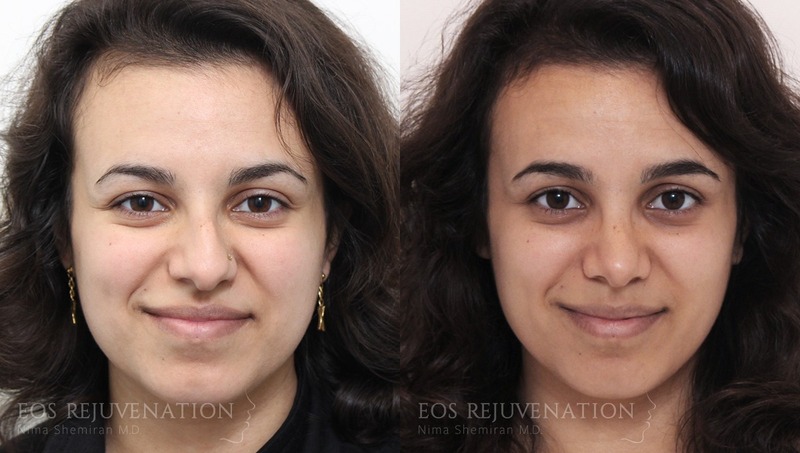 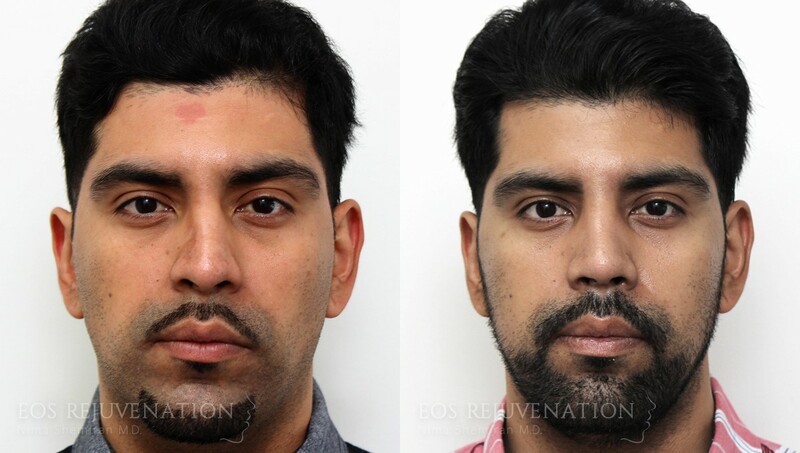 These results are six months after rhinoplasty. 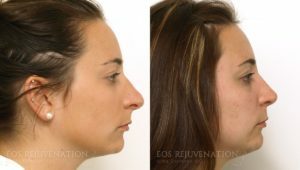 This young woman came in because she wanted a rhinoplasty procedure as well as a chin augmentation. 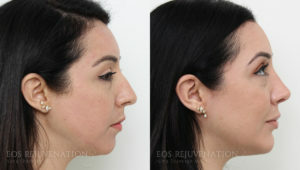 On frontal view, her tip is bulbous and she wanted something thin and more refined. These results are taken 18 months after her open rhinoplasty procedure. 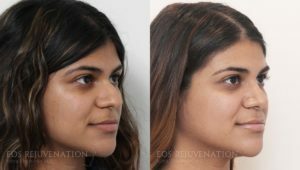 The hump has been removed, the tip is more defined and lifted, and her chin augmentation looks nice and natural, giving more balance to her face. This young Arabic woman came in looking for a more feminine nose. 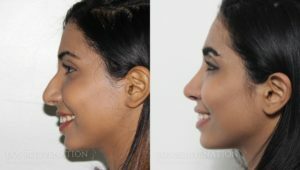 She had a slightly droopy tip, a dorsal hump, and on frontal view a more bulbous tip. 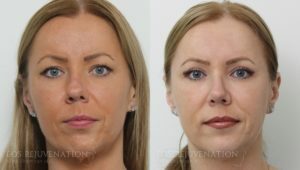 She wanted something that looked more natural and fit her face accordingly. 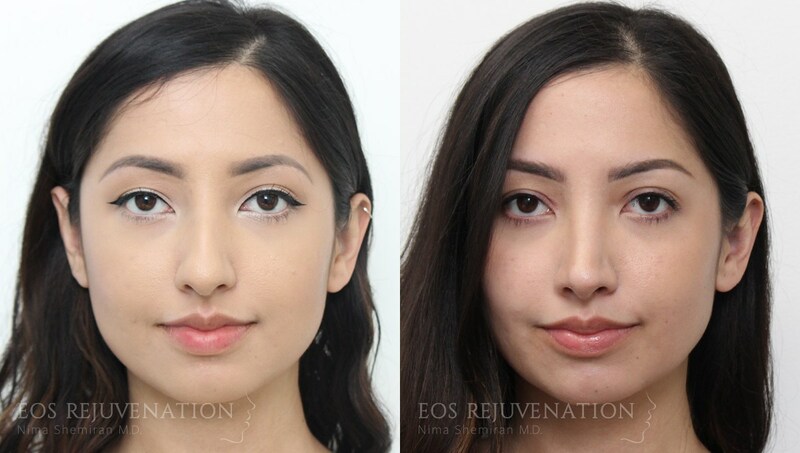 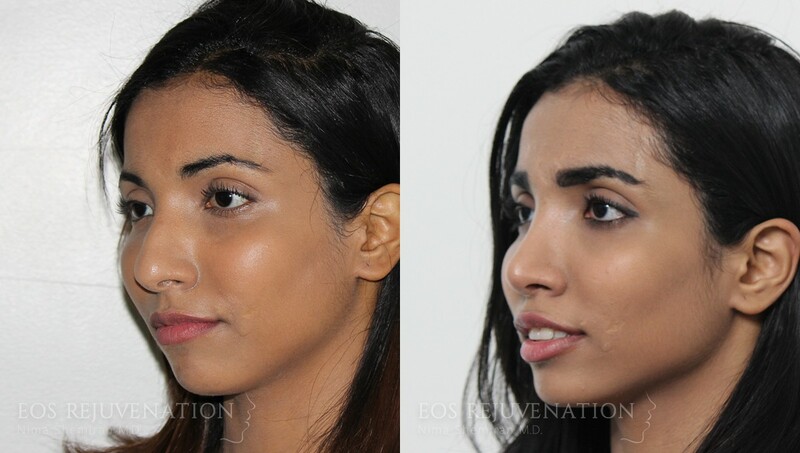 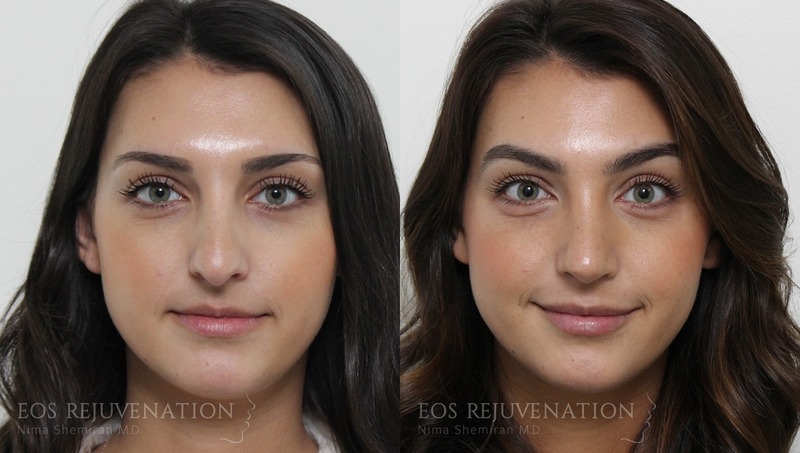 These results are taken six months after her primary rhinoplasty surgery showing a nice profile that is relatively straight with a feminine curve, a tip that does not droop, and a nose that is more defined on frontal view. She is very happy with the results. This gentleman came in because he was involved in altercations when he was younger, causing a deviated nose towards the left side on frontal view. 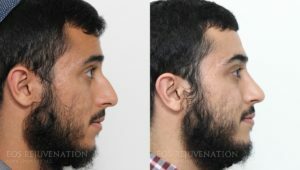 He also had a droopy tip because he had loss of tip support. 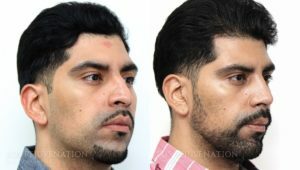 He had a tiny dorsal hump that he wanted removed. 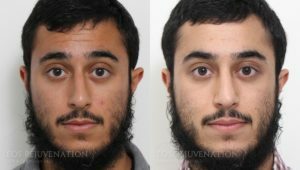 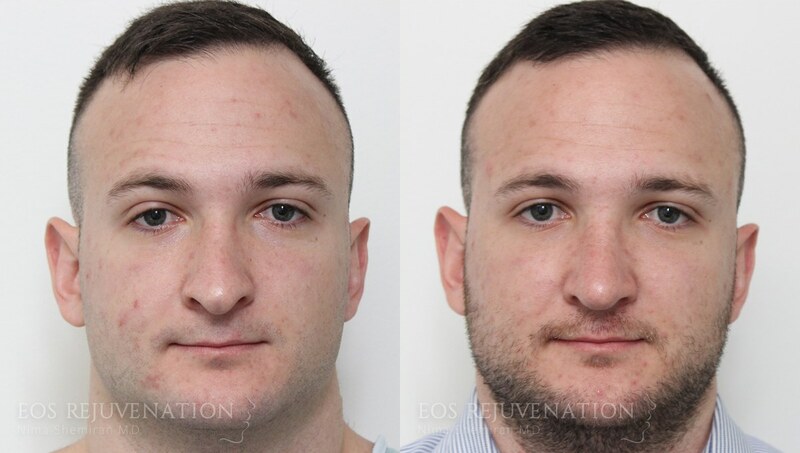 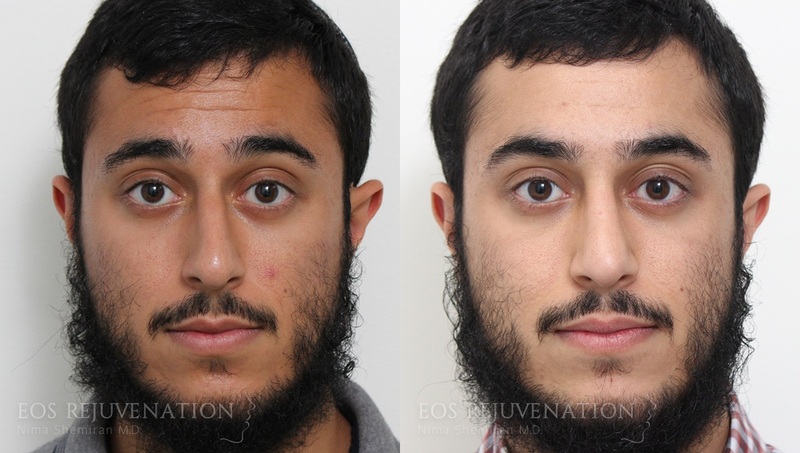 These results are shown 6 months after rhinoplasty surgery, his nose is more straight on frontal view, the tip has been lifted in a masculine way, and he looks very natural. 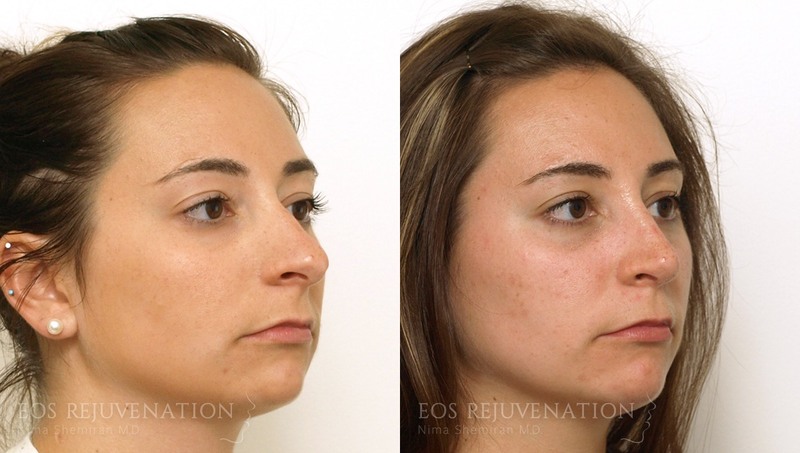 This young woman had a difficult case because her cheek was relatively flat, making her nose look larger than it is. 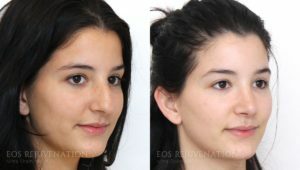 In addition, her nose and forehead blended, and this needed to be addressed at the time of rhinoplasty surgery. 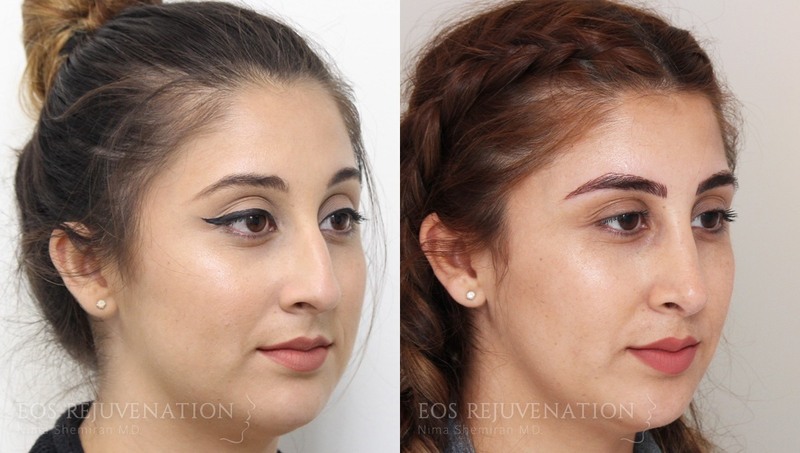 She wanted a smaller nose that was slightly lifted and a more defined tip on frontal view. 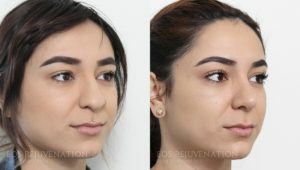 After open rhinoplasty, the tip has been lifted, the bridge has been taken down, and the junction of the upper lip and the nose has been taken in as well to make the nose appear more proportional. On frontal view, her nose looks more symmetric because the columella is now in the midline and she has been very happy with the results. 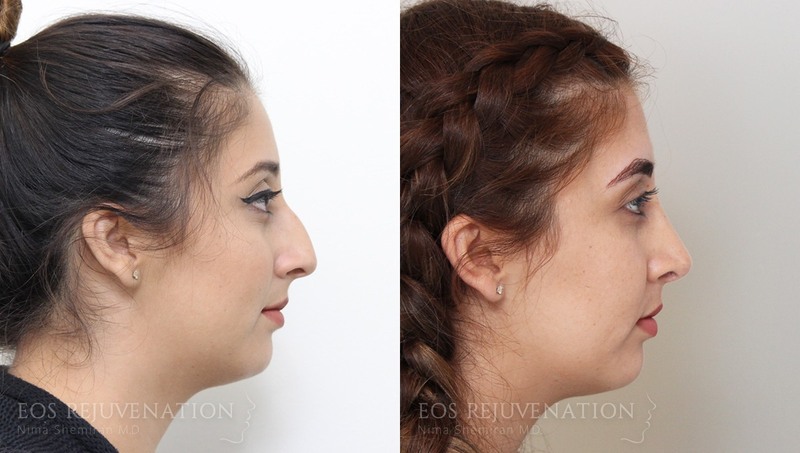 These photos are taken 8 months after her rhinoplasty surgery. This young female nurse came to see me for rhinoplasty surgery as well as trouble breathing through her nose. She has a small dorsal hump and a slightly droopy tip. 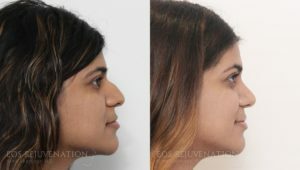 She also has an underprojected chin and wanted a chin augmentation. 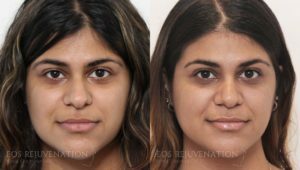 These results shown are nine months after her surgery with an open rhinoplasty and chin augmentation. 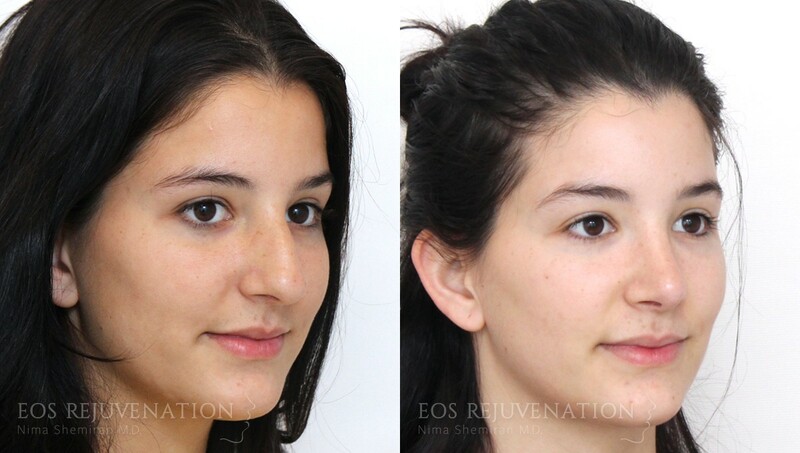 Her nose has been lifted, the frontal view shows a more balanced nose, and she is very happy with the results.